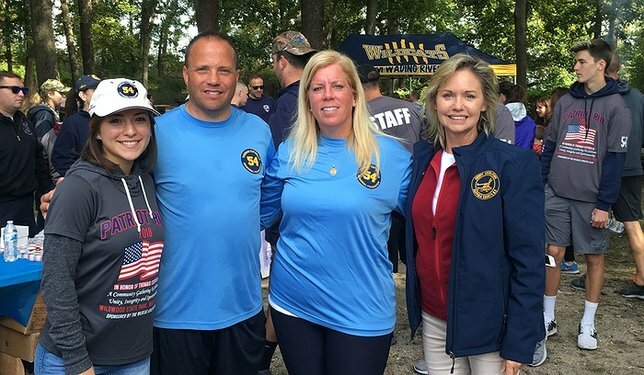 Wading River, NY - October 18, 2018 - On Sunday, October 14th, Suffolk County Legislator Sarah Anker attended the 4th Annual Patriot Run at Wildwood State Park in Wading River in honor of Thomas Cutinella, a Shoreham-Wading River High School student who passed away in October 2014 due to a football-related injury. In response to this tragic event, the Cutinella Family started the Thomas Cutinella Memorial Foundation to continue his legacy by advocating for increased sports safety measures in schools, helping other students achieve their goals of attending college through its scholarship program, and spreading positivity through its Act of Kindness and Good Deeds program. Thomas’s good friend and former SWRHS student Gina Mingoia was present to sing the National Anthem, as well as a song she wrote for him after his passing entitled “I Wish (Tom’s Song).” The Suffolk County Sheriff’s Emergency Response Team was also in attendance and participated in the race carrying the Blue Line American Flag. The foundation can be recognized throughout the community with many signs, local businesses, and cars displaying a blue and gold “54,” which was Thomas’s Shoreham-Wading River Varsity Football jersey number. For more information on the Thomas Cutinella Memorial Foundation, please visit www.Tom54.org. Subject: LongIsland.com - Your Name sent you Article details of "Legislator Anker Attends 4th Annual Thomas Cutinella Patriot Run"